Thyroperoxidase (TPO) is a 933-amino acid, type I transmembrane glycoprotein that plays a key role in thyroid gland function and autoimmunity. Thyroperoxidase (TPO) is a 933-amino acid, type I transmembrane glycoprotein that plays a key role in thyroid gland function and autoimmunity. It is present as a dimer on the apical surface of thyroid follicular cells. TPO functions in the iodination of tyrosine residues in thyroglobulin and phenoxy-ester formation between pairs of iodinated tyrosines to generate the thyroid hormones, thyroxine and triiodothyronine. Mutations in this gene are associated with several disorders of thyroid hormonogenesis, including congenital hypothyroidism, congenital goiter, and thyroid hormone organification defect IIA. Malignant thyroid tumors exhibit an anomaly in TPO resulting in lower affinity for anti-TPO. 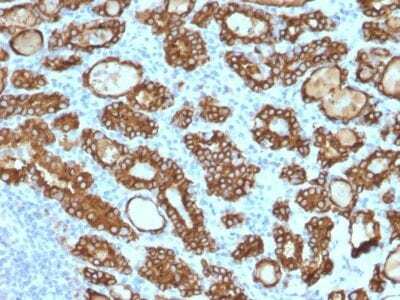 This antibody may aid in the differentiation between benign and malignant thyroid tumors. Catalog number key for antibody number 1922, Anti-TPO (TPO/1922) The prefix indicates conjugation, followed by the antibody number and size suffix. Fayadat, L., et al. 1998. 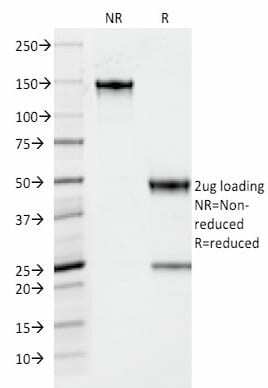 Human Thyroperoxidase is largely retained and rapidly degraded in the endoplasmic reticulum. Its N-glycans are required for folding and intracellular trafficking. Endocrinology 139: 4277-4285.